Giant Normura jellyfish off the coast of Japan..
They’re called Normuras and they can be as big as 100 feet in length and more than six feet in diameter. 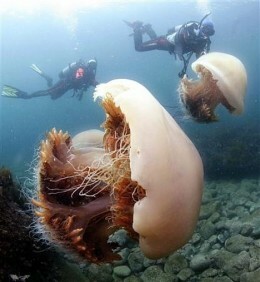 If you were able to pick one of these jellyfish up you’d be holding something as heavy as 450 pounds! They exist primarily off of the coast of Japan. This entry was posted in 5% acetic acid/Vinegar on jelly stings, Box jellyfish, florida-jellyfish-portuguese-man-of-war-florida-beaches-long-island-beaches-hawaii-waikki-oahu-guam-austalia-stingersmauve-jellyfis-pelagia-nortiluca-black-sea-nettles-stingrays-sport-fi, jellyfish, jellyfish sting first aid, Jellyfish sting remedy, jellyfish stings, Lion's mane jellyfish, Man of War, marine sting first aids, marine stings, Pacifici coast sea nettles, Pelagia Nortiluca, sea nettles, StingMate, Uncategorized, Vinegar on Jellyfish stings. Bookmark the permalink.